ADC liaises on behalf of its members with the Health and Safety Executive and other organisations who recognise ADC as speaking on behalf of the majority of companies involved in this industry. Engineers Ireland is Ireland's professional body for engineers and engineering in Ireland. The Corporate Partner membership champions excellence in engineering by providing the best network for senior executives in the industry to exchange ideas and share best-practice. Achilles deliver managed supplier pre-qualification programmes, carry out industry audits, mitigate risks, cleanse supplier data and provide reports and analysis to drive continuous improvement. Construction line allows all of their suppliers to be pre-qualified to the official Government pre-qualified standards. The Construction line assessment scheme, mainly used by local authorities and government departments, is also available for use by any organisation looking to short list suppliers and contractors and can save time and money for all parties. It provides information and assurances about the health and safety systems and competence of the organisations who have been Construction line assessed or accredited. It has been developed and refined by Government Health and Safety and Procurement Professionals, with the support of the Health and Safety Executive. • Implement an occupational health and safety management system which meets the requirements of the organisation – incorporating continual improvement. Prior to any person or company acting as a diving contractor, they must ensure that the HSE is provided with relevant information about their identity and where he or she can be contacted. 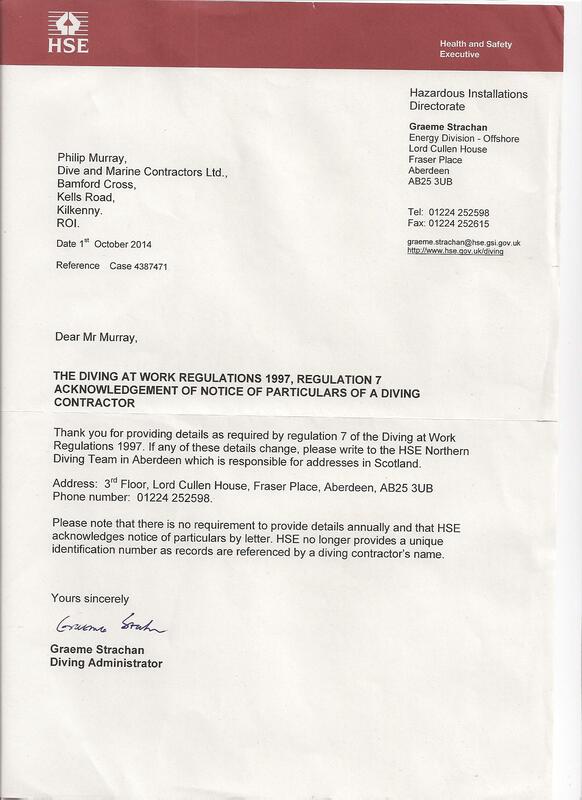 The diving contractor is also required to inform the HSE of any subsequent changes to this information. 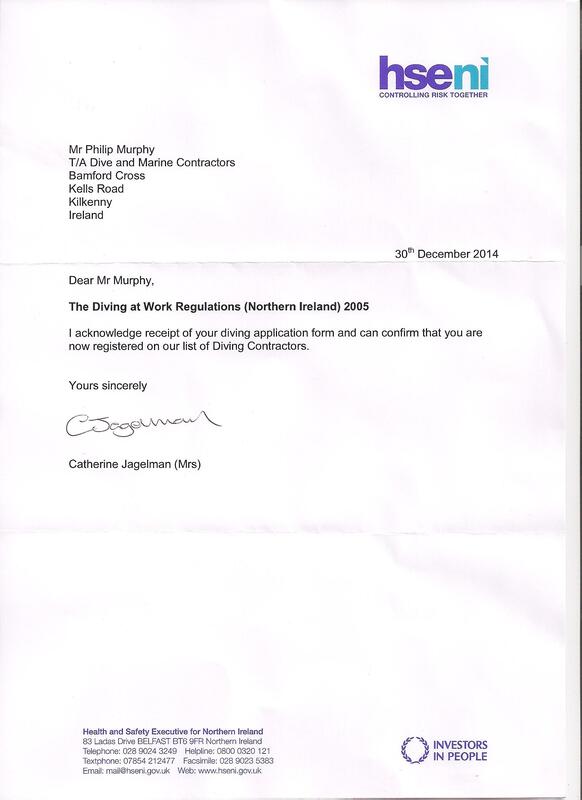 Full details required are set out in Schedule 1 to the HSE Diving Regulations. HSE will acknowledge receipt of such information. No person shall act as a diving contractor unless the particulars listed in Schedule 1 have been supplied in writing to the HSE by or in respect of that person. Under the Safety in Industry (Diving Operations) Regulations, 1981, there is a legal requirement to notify the Health and Safety Authority in writing of the intention to dive. The notification must be received by the Authority, to carrying out any diving operations to which the regulations apply. (PDF 45KB opens in new window) or by other suitable methods. If using an alternative method it is a legal requirement that the information submitted includes the name of the person who is carrying out the operation and the place at which it is intended to carry out the operations.